Kozhikode reiterated the fact that it never felt the dearth of artists at school level. Having put up a consistent show in all the State School Art Festivals held ever since it was instituted, this time too it raised the bar by being the victors at 53rd State School Art Festival grabbing 912 points from 232 events. 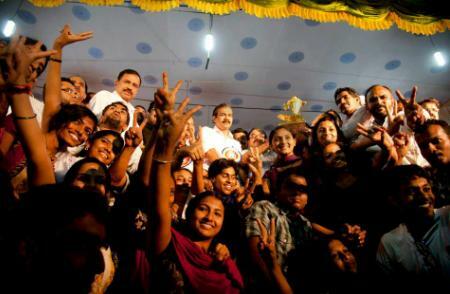 This is the 7thconsecutive time Kozhikode emerged as the winners, overall its their 14th time. Thrissur came second with 900 points. The host Malappuram attained the third place with 881 points and it was a special add on for them being the host team. The golden cup (actual one made of 117.5 Sovereign gold) model was presented to Kozhikode team by Kerala Education Minister P K Abdurab. Unfortunately the cup was broken into two pieces because of the rush among the crowd. Director of Public Instructions A. Shajahan read out a message by Leader of the Opposition V.S. Achuthanandan, who couldn’t make it to inaugurate the finale as agreed. Minister for Urban Affairs Manjalamkuzhi Ali released a souvenir. Minister for Social Welfare and Panchayats M.K. Muneer gave away trophies to schools which topped in the festival. The Chief Chef of the festival Pazhayidam Mohanan Namboodiri was facilitated at the function. Durga Higher Secondary School, Kanhangad, secured maximum points (123) in higher secondary category. BSSGHS, Alathur, Palakkad, topped in the high school category. When Malappuram, Palakkad, Kozhikode, and Thrissur shared the first prize in the Arabic Art Festival (95 points), Kannur got the second prize (93 points). GHSS, Thalapuzha, Wayanad, topped in the Arabic fest. In the Sanskrit Art Festival, Palakkad and Kannur shared the first prize by scoring 95 points. Thrissur, Kasaragod, Malappuram, and Kottayam shared the second place with 93 points. Durga HSS, Kanhangad, topped in the Sanskrit festival. Undoubtedly this time around the fest was successful in garnering maximum media attention for the positive things. The event ended on a high note with a lot of expectations for the next year’s fest to be held at Palakkad.